After more than a decade of war, deadly drone and military attacks spread the conflict across the Afghan border into Pakistan. Afghans struggle to change a world increasingly dominated by violence and corruption. Pakistani workers and peasants fight back against worsening economic times with militant strikes and protests. 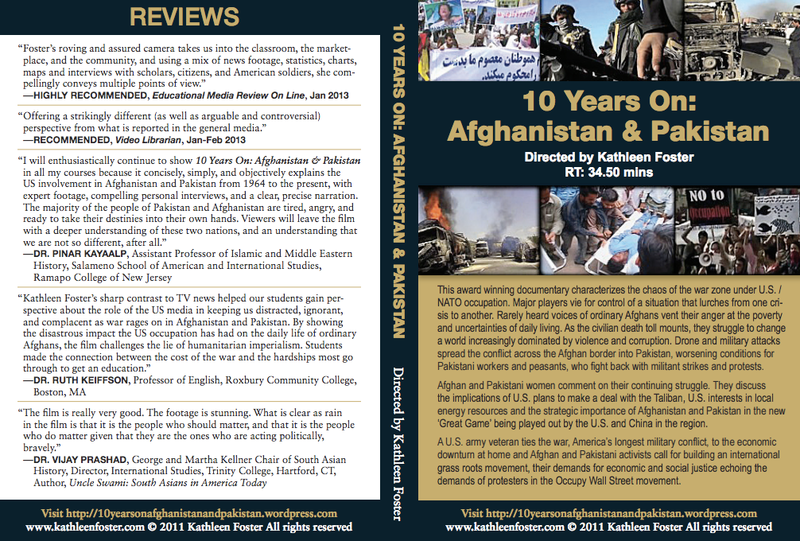 In the film, Afghan and Pakistani women comment on the continuing struggle of women resulting from this War on Terror. They discuss the implications of U.S. plans to make a deal with the Taliban, and give insight into U.S. involvement in the region. Activists call for building an international grassroots movement, their demands for economic and social justice echoing the demands of protesters in the Occupy Wall Street movements. "The film is really very good. The footage is stunning. What is clear as rain in the film is that it is the people who should matter, and that it is the people who do matter given that they are the ones who are acting politically, bravely." This timely documentary dramatizes the tale of a remarkable group of women and how their courage and commitment to change their lives and country has passed from one generation to the next. Their disturbing and amazing stories reflect the recent history of Afghanistan during a quarter-century of cataclysm: from proxy war to civil war, from a Soviet-backed regime to the oppressive rule of the Taliban, and to U.S. military intervention and the current sway of regional warlords in a climate of general instability. 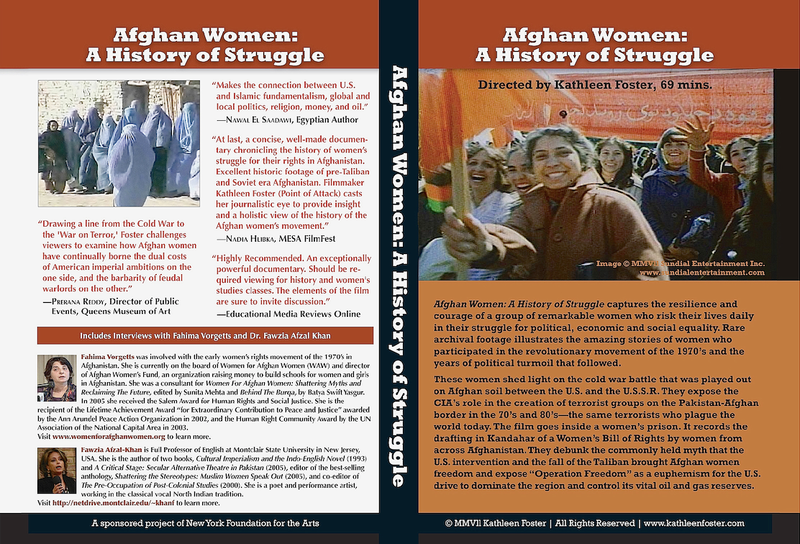 The authors of American War Cinema and Media Since Vietnam (Palgrave Macmillan, 2013) cited Afghan Women: A History of Struggle as one of only three films that "challenge the dominant ideologies found in contemporary mainstream American war films." Drawing a line from the Cold War to the "War on Terror," Foster challenges viewers to examine how Afghan women have continually born the duel costs of American imperial ambitions on the one side, and the barbarity of feudal war lords on the other. PRERANA REDDY, Director of Public Events, Queens Museum of Art. Trump's attacks on Muslims and immigrants today are rooted in the Patriot Act and legislation passed after 9/11. This led to the racial profiling, large-scale roundups, detentions, and mass deportations of Arab, Muslim, and South Asian men and the first Muslim registry! 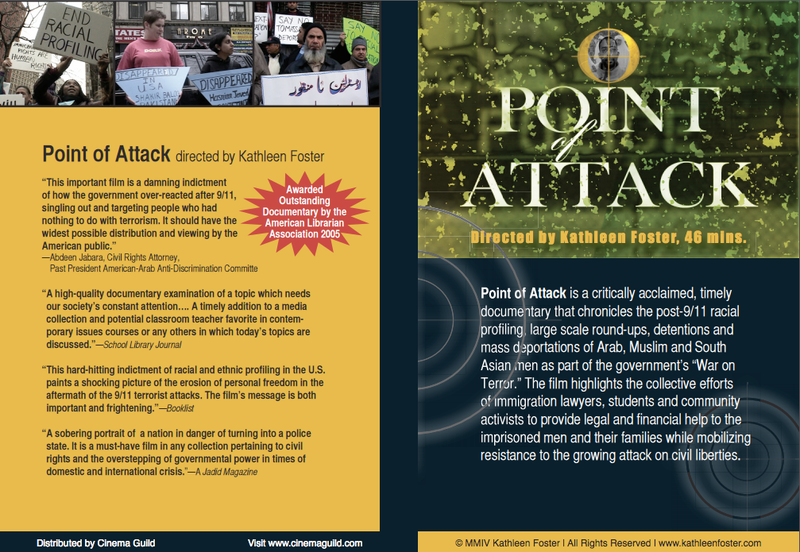 Point of Attack is about that time, and the resistance that was mounted by immigration lawyers, students and community activists. Although the "point of attack" of these laws are Muslims, then and now, the broader undermining of basic freedoms for all of us is explored. This film is as timely now as it was then! "This important film is a damning indictment of how the government over-reacted after 9/11, singling out and targeting people who had nothing to do with terrorism. It should have the widest possible distribution and viewing by the American public." "This hard-hitting indictment of racial and ethnic profiling in the U.S. paints a shocking picture of the erosion of personal freedom in the aftermath of the 9/11 terrorist attacks. The film’s message is both important and frightening." Twenty years after the Sandinista revolution, a group of social activists from a Brooklyn, New York church, visit their sister-church in Managua. As they travel around the country, a stark portrait of current conditions in Nicaragua emerges. Their hosts talk about how and why the revolution failed and of their continuing struggle to fulfill their dreams of a just society. Barriers of language, national borders, race and religion are overcome as global friendships are cemented and a renewed commitment to fight for social change is made. Distributed by Latin American Video Archives. Nicaragua: Reclaiming the Revolution "has captured complexities of the political evolution of the FSLN that have eluded some academic writers. Stills and video are used deftly to show the tumultuous history of Nicaragua in the 1980's." "Clearly articulating the devastating effect of the global economy on local communities, this powerful film demonstrates the value of cross-cultural relationships and shows one community's desire to make a difference beyond charity towards change." REV. DAVID DYSON, pastor Lafayette Ave. Presbyterian Church, People of Faith Network. The film follows the yearlong battle waged by parents, students and teachers to stop budget cuts to New York City's already devastated public schools. Distributed by Third World Newsreel. "A powerful film that forces all the basic issues about racial justice. Students and teachers speak with eloquence and urgency about realities they know first hand. No euphemisms. No evasions. No clichés. It has the ring of truth." JONATHON KOZOL, educator, author of Savage Inequalities, Death At An Early Age. "Kathleen Foster has produced and directed a video that focuses on a REAL issue of public import…that the belief in justice and equality and resistance to their absence did not die with the movements of the 1960's." Filmed in an isolated hollow of West Virginia, this documentary shows the violent clash between miners and the two giant coal companies that dominate their lives during a 1989-1990 strike. Wives of the striking miners and a Black retired miner tell the story. "Kathleen Foster blends echoes of the 1921 Blair Mountain strike with a contemporary sense of the declining strength of national unions." D. LEDBETTER, Village Voice.